Making the most out of summer is in the Danish DNA. As soon as the sun comes out, they flock to the green areas of the numerous parks, go for swims in the lakes or the canals and just enjoy being outside. Copenhagen is the perfect city to enjoy warm summer days, since it has so many great parks and water areas. And left alone, all the cafés and bars where you can spend time with friends or a good book. But for those looking for small adventures in close proximity of the city, the area offers plenty of places to visit and summer activities to try. Kronborg, which served Shakespeare as the inspiration for Elsinore castle in his play Hamlet, is one of the most beautiful Renaissance castles in northern Europe. Kronborg has a lot of history to tell. Built in the 1420s, and situated at the Øresund, it was a strategically important point and was used to control the entrance to the Baltic Sea. It was destroyed in a fire in 1629, but then incrementally rebuilt by Christian IV. In 1658, it was briefly occupied by the Swedes, and in 1758 it lost its royal status and was turned into military barracks. Let Kronborg take you back in time and let its walls tell their story. Mingle with local Danes and go for a free swim in the harbour whilst enjoying a marvellous view of the Copenhagen skyline. There are five pools in total, of which two are designed for children. Lifeguards supervise the swimming activities and the water quality is checked daily. Islands Brygge also offers green areas to relax and play in. Dyrehaven is a 1,100-hectare park in the north of Copenhagen. It is famous for its more than 2,000 deer – red, fallow and sika – that live and can be observed here. So don’t forget your binoculars! Romantics can have a picnic or take a horse carriage tour through the park. And why not combine a visit with a trip to the world’s oldest amusement park: Bakken. If you are looking for the ultimate adrenalin kick, combined with a beautiful view over Copenhagen – and can somehow manage to keep your eyes open – a bungy jump might be the right pick for you. At Bungyjump Copenhagen, you jump off a 69-metre high platform located at Refshaløen, which is just opposite the harbour where the Little Mermaid is sitting as a watchdog on her rock. Water sports lovers can show off their wakeboarding and waterskiing skills at the Copenhagen Cable Park in Amager. The centre is dedicated to your enjoyment and ensuring you a safe and exciting time on the water. Athletes of all levels are welcome, as long as they are willing to take the risk of getting addicted to the sport. To get the best of Copenhagen and a different perspective on its city life, sights and architecture, you should get into the water and start paddling. You can either go on a 2.5-hour guided group kayak tour with two instructors and learn more about Copenhagen or choose to explore the city individually. Even without taking a course, you can rent a kayak, which is safe and easy to handle, and cruise through the canals. For animal lovers who like adventure, Knuthenborg Safari Park is the perfect getaway. With an area of more than 500 hectares, it is the largest wild animal park in northern Europe, offering visitors the chance to get very close to zebras, giraffes and antelopes in the Savanna section, kangaroos and emus in its Fasan Forest and Siberian tigers in the Tiger Forest. Since its opening in 1860, it has been one of the traditional and prestigious tourist attractions in Denmark. Klatreskoven is an outdoor tree-top climbing centre in the historical Carlsberg area. Visitors follow routes up to 22 metres high, but all climbers are safely secured, so there’s never any need to send in Sly from Cliffhanger. Test your vertigo, co-ordination and balance in a fun outdoor environment. There are obstacles such as cars among the trees and the routes vary in difficulty. There is only space for 100 climbers at a time, so it is recommended you show up early or book in advance. A great opportunity to get away from the city without travelling too far is provided by Copenhagen Zoo. Located in Frederiksberg, and enclosed by two big parks, it is home to more than 3,000 animals at its 11-hectare site. It is the only zoo in Europe that houses the Tasmanian devil. One of its biggest attractions is the elephant house, which was designed by renowned British architect Norman Foster. While many elephant stables at other zoos are dark and gloomy, Foster’s elephant house is anything but and includes various natural elements such as a big water tomb where the elephants can be seen bathing. Or for a more hands-on experience, you can head to the African dwarf goats and farm animals, where petting is permitted. MTB organises mountain bike tours around the Copenhagen Green Belt that last around three hours and take in the deer park, water mills and lakes, and maybe a stop in the city of Lyngby. 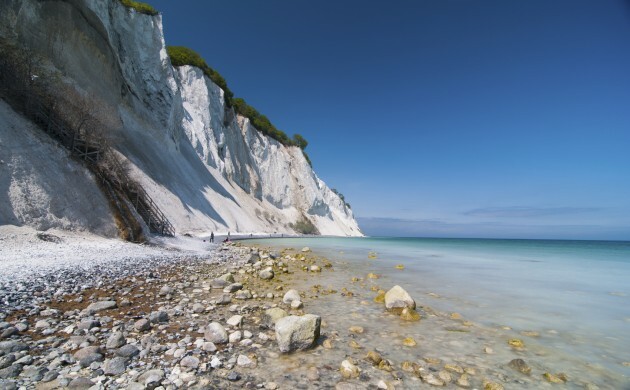 One of the most amazing sights Denmark has to offer is Møns Klint, the white cliffs on the island of Møn. Just 137 km away from Copenhagen, they are the perfect destination for a day-trip. Formed during the last ice age, the enormous chalk cliffs rise up to 100 metres above sea level and stretch for six kilometres. The chalk of the cliffs consists of old skeletons that are 70 million years old. You can find fossils of squids, sea urchins, mussels and algae on the beach. Møn’s cliffs have some amazing formations – the biggest one being the 128m-high Dronningestolen (the Queen’s chair). Every visit is unique due to the changing seasons and time of day. The contrast between the dark-blue Baltic Sea and the white chalk cliffs is strong and light reflections at the cliffs are at play. A good time to visit is around noon when the midday sun makes the cliffs and their reflection in the water sparkle and creates vivid images, while sunrise or sunset are also good times to go. You might be lucky enough to catch a glimpse of the fastest animal in the world, the peregrine falcon, which has been breeding at the cliffs for more than a decade. When on the hunt for prey, peregrine falcons can reach speeds in excess of 300 km/hour.